In a relatively short time, "Wicked" has become a musical for the ages and it is not difficult to understand the phenomenon. This show succeeds extremely well on many different levels. It starts with solid storytelling; serious themes, populated with engaging characters but with a sense of humor. A strong contributor is the unique fact that both leads are strong, multi-dimensional females. All this helps to underpin an emotional reality in a fantastical setting, for this is the back-story of "the witches of Oz before Dorothy dropped in" and how friendship can shape our lives. "Wicked's" status as a timeless work is due in large part to the music and lyrics of Stephen Schwartz. Combined with the vocal artistry of the cast, the songs leave an indelible impression. 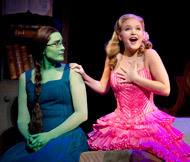 The Act One closer, "Defying Gravity" melds every element of theatre into one chill-inducing moment. That song, along with others like "I'm Not That Girl" and "For Good" are already popular standards due to their tenderness and heartfelt lyrics. On the opposite end of the emotional scale is the giddy anthem of bubbly blond sorceresses everywhere, "Popular." This song is so frothy that it probably put a smile on people passing by the outside the theater. Dee Roscioli, the 'wicked" witch Elphaba in this production has played the role more than any other performer and her experience is evident. One needs a stellar voice for this complex role and Roscioli delivers goose bumps with almost every solo. As her opposite, understudy Megan Campanile gives a beautiful texture to the flouncy, bouncy "good" witch Glinda. The entire cast matches their energy and verve. The lighting is spectacular and the sets are practically a life form of their own. The crowds at this Bushnell return engagement are packed with prior fans that know the lines and music by heart. But there are plenty of newcomers as evidenced by the surprised laughter and gasps emitted upon seeing the show's many high points for the first time. Both types of audience members are well served by this outstanding, and yes, magical production.